requires long-term averaging and minimum statistics. This is well suited for environments with slowly changing noise characteristics. When the noise characteristics change quickly over time, noise cancellation microphones can be used to significantly improve the SNR, without introducing distortions to the desired speech. A noise cancellation system uses two or more microphones. The additional microphones sample the noise of the acoustic environment without the presence of speech, then those signals can be subtracted from the original microphone. This changes the problem from trying to estimate the noise spectrum to estimating the transfer function between the microphones. This is a better solution because the noise spectrum can change quickly over time, but the transfer function typically changes much more slowly. VOCAL’s Microphone Adaptive Noise Cancellation Software can remove additive noise even when the signal to noise ratio (SNR) is very low, about 0 dB. 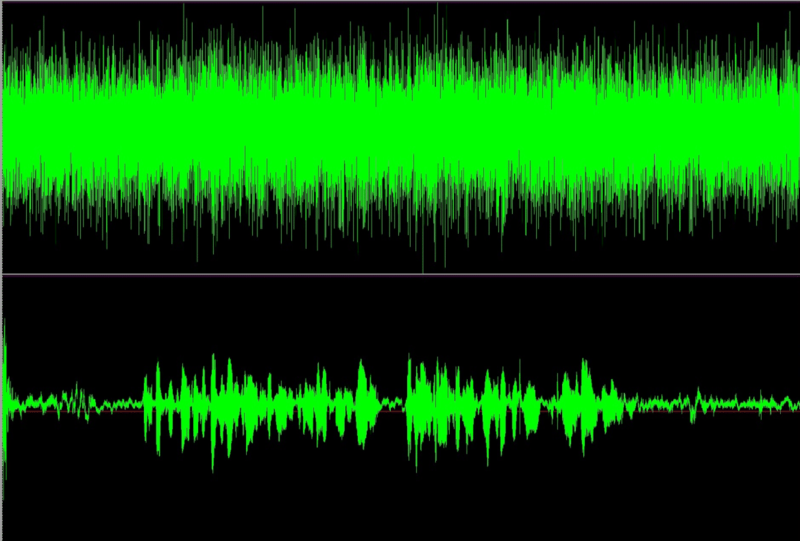 The figure below shows the before and after noise cancellation of a noisy speech signal. After a short training period the noise cancellation microphone solution is able to improve the SNR about 12dB. VOCAL’s Noise Cancellation software is available as a standalone module or as part of a comprehensive VoIP System customizable to most platforms and environments. Please contact us to learn more.